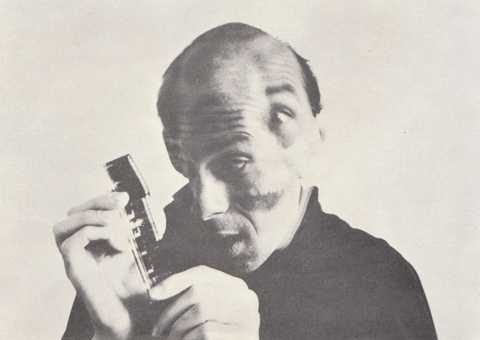 Byron Black worked in film, video, photography, mail art, and performance during the decade he spent living in Vancouver. He was known as Baron Infinity when he hosted Vancouver’s first art TV show, on community cable. In The Holy Assassin, his second feature-length film, shot from 1972-74, Black plays a marooned alien; other roles are filled by housemates, friends, and fellow artists. Working in a largely improvisatory context, Black’s film portrait of Vancouver in the early '70s has a spontaneity that yields results at once utterly bewildering and surprisingly intimate. As Tony Reif writes in Vancouver Art and Artists, the film takes “post-hippie psychodrama to the point of cosmic absurdity.” Shot handheld on 16mm, Black careens in and out of the frame as the film jump-cuts across eminently recognizable parts of town at breakneck pace. The Holy Assassin possesses a joie de vivre that is lodged somewhere between art happening and B-movie, and a kineticism that recalls the Soviet vanguard. Colour, 16mm. 65 mins. Programmed in parallel with Anamnesia: Unforgetting, a series of curatorial projects from VIVO Media Arts Centre’s Crista Dahl Media Library and Archive. What’s a sentient being like you doing in an incarnation like this?, a program of Byron Black’s 1970s and 1980s videos, will screen on Thursday November 15, at 7:00 pm, at VIVO (www.vivomediaarts.com). The Holy Assassin is held by The Cinematheque's West Coast Film Archive.